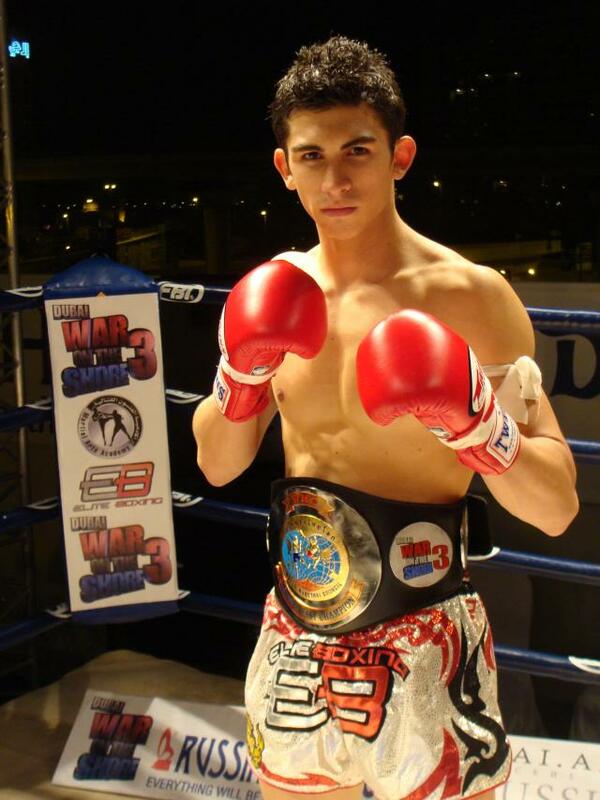 "elite boxing","muaythai","muay thai","thailand vs challenger","thailand vs middle east"
Both championship were broadcasted on Fox Sport TV, Al Jazeera Sport TV, Dubai Sport, and NTV+ (Russia). 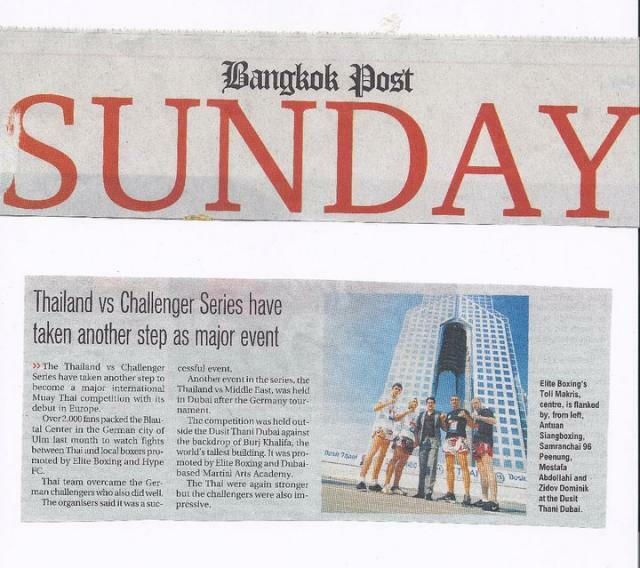 The inaugural Thailand vs Challenger muaythai series reached its impressive conclusion yesterday at the Thailand vs Middle East event in Dubai. 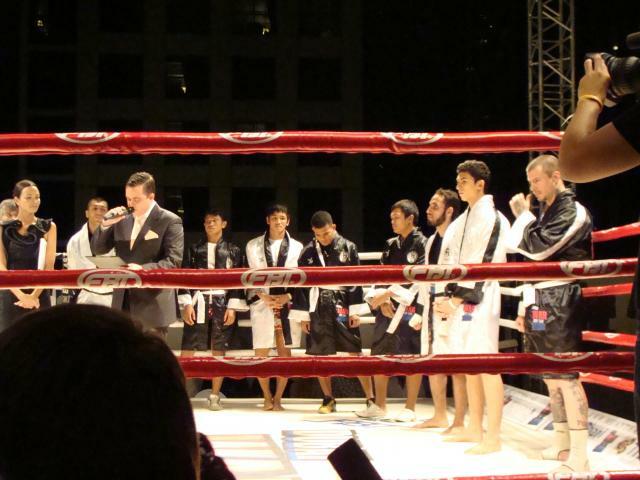 Held outdoors at the Dusit Thani Dubai against the stunning backdrop of the Bhurj Khalifa, the world’s tallest building, Thailand vs Middle East was a co-promotion between Elite Boxing and Martial Arts Academy – the number one Dubai-based promoter and founder of the popular War on the Shore events. While there was a very strong Middle East flavour to the event, Thailand was still very well represented. In addition to being held at the Dusit Thani, a Thai hotel chain, the event was hosted by Thai model and actress Sonia Couling, who flew in from Bangkok for the event. The Thai team was also determined to play its part and defend the pride of their nation. 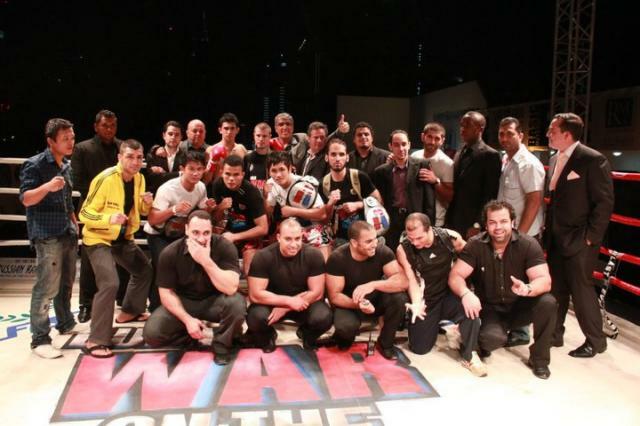 The impressive fightcard featured four warm up fights, three match-ups as part of the Thailand vs Middle East main event, and one additional Elite Boxing Superfight. 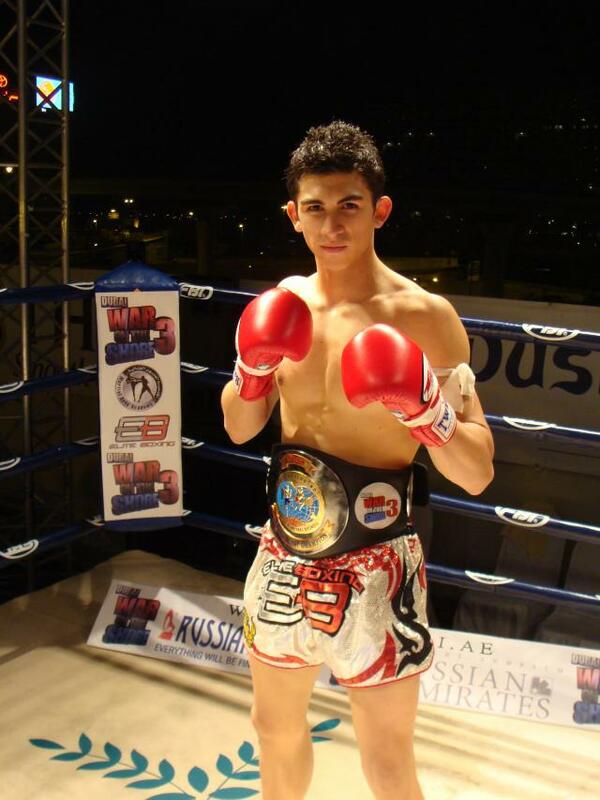 The first Thailand vs Middle East fight saw Mostafa of Iran take on Samrachai of Thailand. 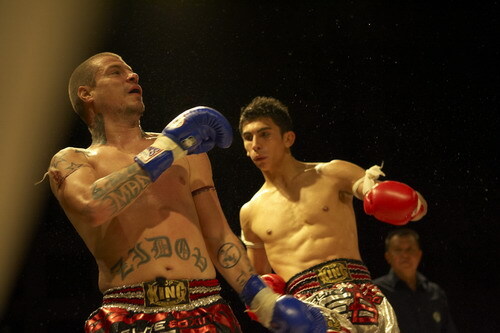 It was a very close fight and even though Mostafa got a cut over his right eye in the third round, he fought on bravely against his Thai opponent. 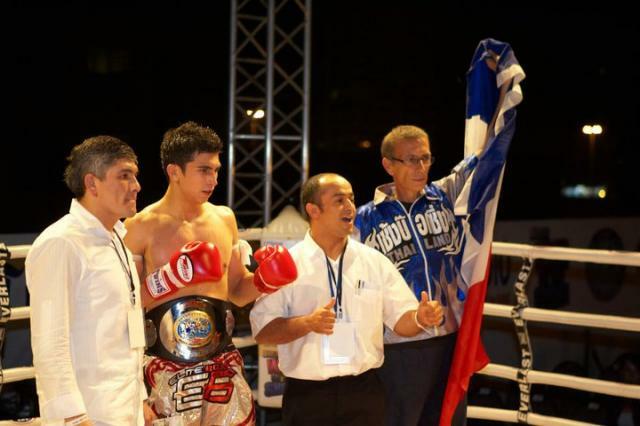 With Mostafa relying too much on clinching, however, he allowed Samranchai to use his greater experience to win the fight on points. 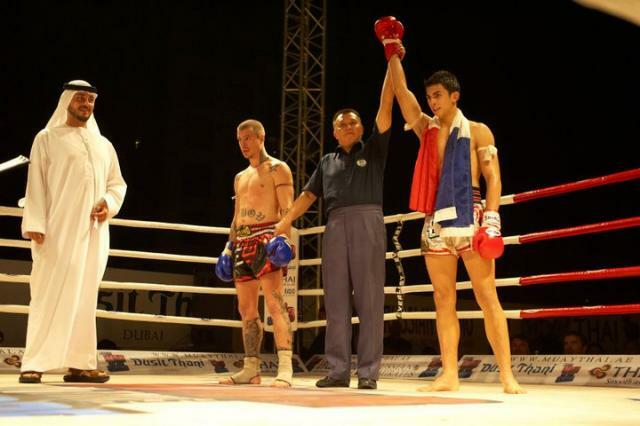 The second fight featured two Thais in Pitsanu and Ole Tor Silachai, who was a late replacement for the scheduled challenger, Vahit Roshani from Iran after the Iranian withdrew with an injury. Despite the lack of a Middle East challenger in this match up, the crowd showed their appreciation for the two Thai fighters who put on a good demonstration of muaythai. The fight went the distance with Tor Silachai winning what was a very technical fight on points. Despite the Middle East team losing the opening fight, there was a great atmosphere among the crowd, which featured a cosmopolitan mix of locals and expats. 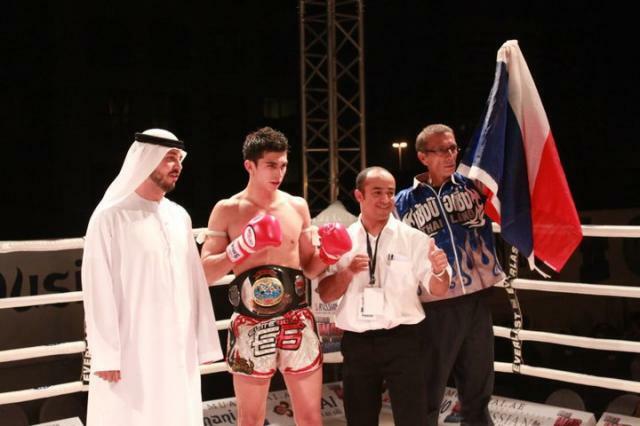 The third Thailand vs Middle East fight saw Ahmaad Saadi of Tunisia beat Wirachat of Thailand after a spectacular knock out in the fourth round. With Saadi already ahead in the first 3 rounds, his spectacular KO against the Thai really got the local crowd on their feet. The crowd had been thoroughly entertained up to this point but the Elite Boxing Superfight was about to take things to another level as TVC favourite Antoine Siangboxing of France took on Zidov Akuma of Switzerland. It was to be another exciting fight that went the full five rounds, making sure the crowd got full value and maximum entertainment. In the very first round, Zidov injured his thumb and although this restricted his options, the Swiss fighter battled on bravely and gave a great performance, pushing Antoine all the way before losing on points. Speaking after the event, Elite Boxing co-founder Toli Makris said, “We are delighted with the way things have gone tonight. 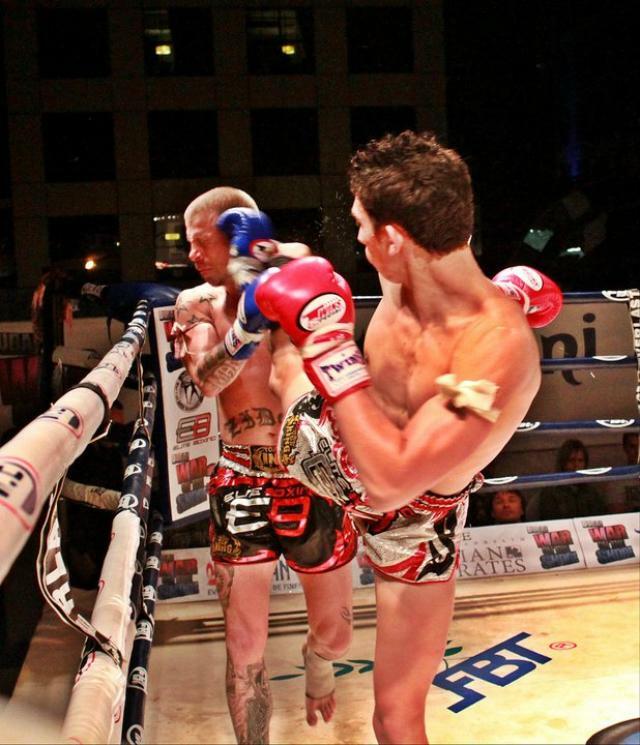 It was a great evening of muaythai and the crowd seemed to really appreciate it. 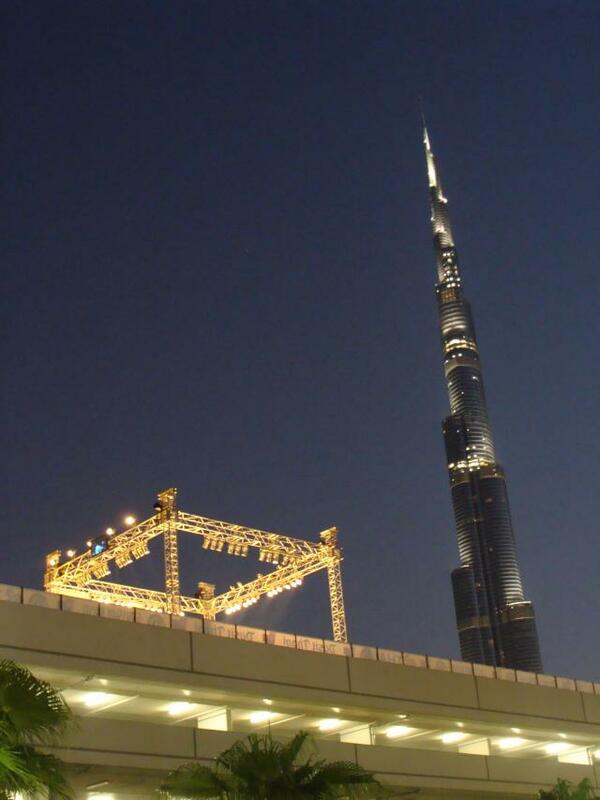 Indeed negotiations are already at an advanced stage to hold at least one more TVC event in Dubai in 2011.